The packaging is half the fun of buying a new Apple device. Typically it involves sleek white boxes that fit perfectly into one another, with no space wasted. And the Apple Watch is no different. These are the first photos of the device's packaging. And as you can see, it's all very minimalist, which is very Apple. The snaps were posted on Instagram from someone in New York City. They show the 42mm stainless steel Apple Watch with the Milanese Loop band. 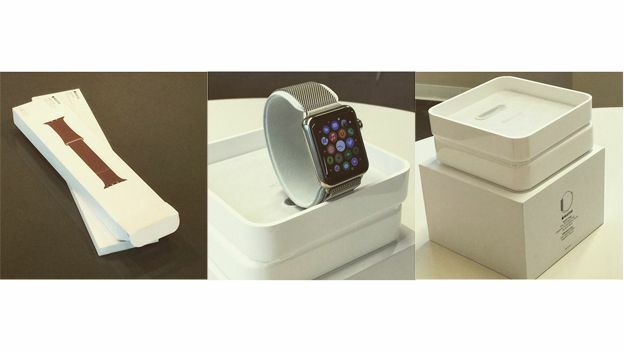 The Watch sits in the main tray, and presumably comes standing up as pictured. It would make it much more impressive than shipping it lying on its side, and Apple is all about first impressions. The straps have their own boxes which are white too, of course. There's no sign of the iconic 'Designed by Apple in California' legend, but we're sure it's there somewhere. Last week, we learned that Apple will only sell the Apple Watch in predetermined case and band combinations, so you can't pick the exact combo you want. Or you can, but it will cost you extra, as you'll have to buy the strap separately. Apple employees will save a bundle on the device, as they can pick one up half price. Though they can't use the same discount on the £13,500 18-carat gold Apple Watch Edition, sadly. More than 1,000 apps have been submitted for the device since the App Store started accepting them a few days ago. Expect plenty of third-party wrist-based shenanigans. Pre-orders for the Apple Watch kick off on Friday, with prices starting at £299. The Watch will hit the shops on April 24.